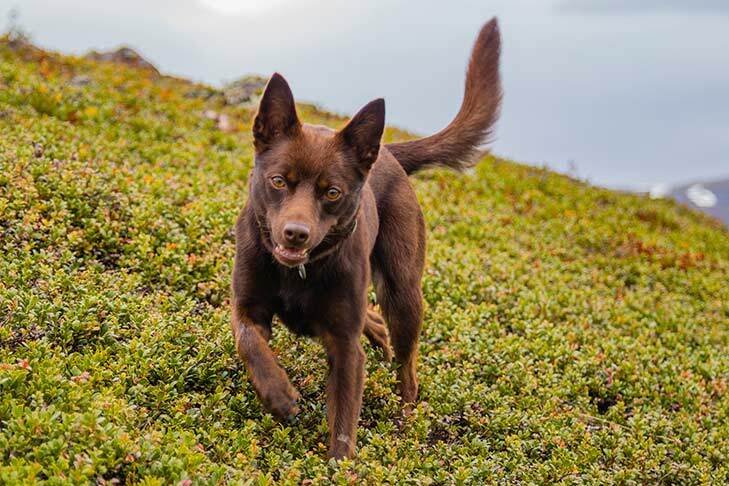 As a herding dog, the Australian Kelpie is intensely loyal and devoted to duty. He has a natural instinct and aptitude for working in sheep, whether it be in open fields or enclosed yards. 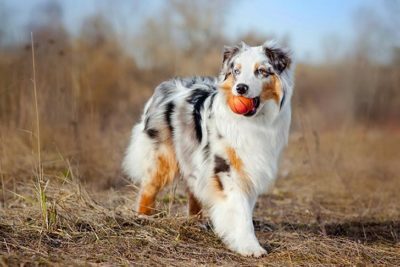 This breed originated from Collie type dogs imported from Scotland, but was developed to withstand the harsh heat and dry conditions of the vast open spaces of Australia. 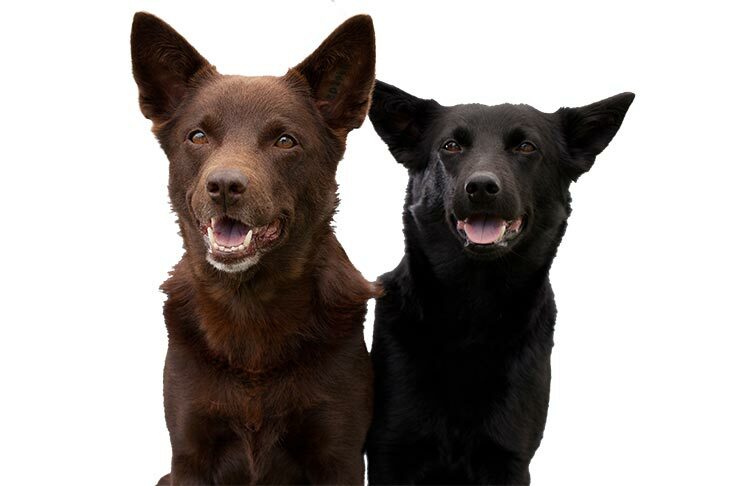 The Australian Kelpie should do well on a high-quality dog food, whether commercially manufactured or home-prepared with your veterinarian’s supervision and approval. Any diet should be appropriate to the dog’s age (puppy, adult, or senior). Some dogs are prone to getting overweight, so watch your dog’s calorie consumption and weight level. Treats can be an important aid in training, but giving too many can cause obesity. Learn about which human foods are safe for dogs, and which are not. Check with your vet if you have any concerns about your dog’s weight or diet. Clean, fresh water should be available at all times. 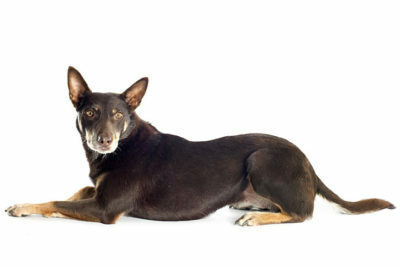 The Australian Kelpie has a double coat with a short, dense undercoat. The outer coat is close, each hair straight, hard and lying flat, so that it resists rain. Kelpies need weekly brushing or combing to remove dead hairs, and the occasional bath will keep them clean and looking their best. Otherwise, the Kelpie is a relatively low-maintenance breed. Australian Kelpies need a lot of exercise to be their happiest selves. A good jog or long workout combined with the mental exercise of obedience lessons should be done daily. Kelpies prefer to have a job to do (they will try to herd other dogs, pets, even children), but they also have an “off” switch. They can do a five-mile run, then settle on the couch with the family to watch a movie. Kelpies are not suited to apartment living as they need space for their limitless energy. Training for dog sports like agility, obedience and rally can be a great way to give your dog exercise. Kelpies are eager for a job to do, so giving them the mental exercise that training provides is a great way to keep them happy and involved. 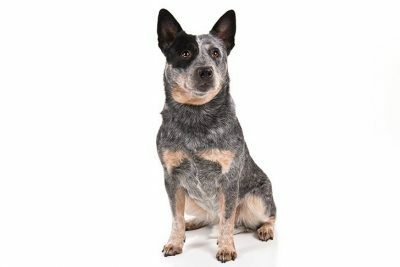 Most Australian Kelpies are healthy dogs. 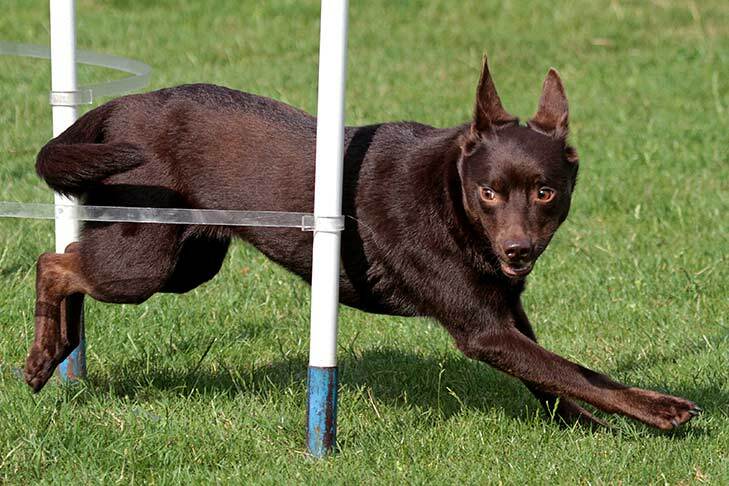 Working with a responsible breeder, those wishing to own a Kelpie can gain the education they need about specific health concerns. Good breeders utilize genetic testing of their breeding stock to reduce the likelihood of disease in their puppies. Following the opening of vast areas of land in the Australian States of New South Wales and Victoria, the sheep numbers increased so dramatically that some properties were over two million acres and ran over a quarter of a million sheep. In areas as extensive as these, herding (originally carried out by convicts) was impractical, wire fences were erected and sheep were left to run free. It was then necessary to have dogs to handle sheep in such large areas. 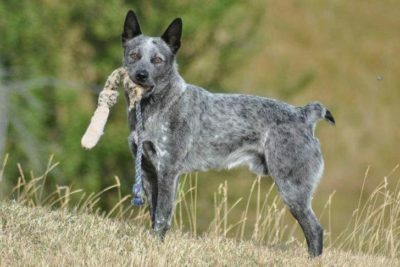 A dog had to be developed to work in the conditions present in Australia. These conditions included heat, rough terrain, dust storms and vast distances. The Kelpie being able to perform the work of several men, were tireless workers in the hottest and dustiest of climates. Like so many breeds, the origin of the Kelpie is disputed. 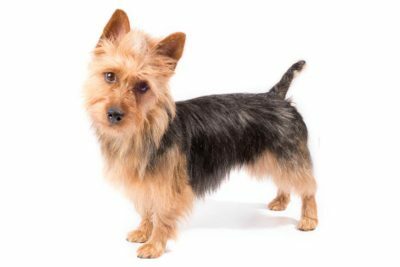 There is no doubt, however, that the origin of the breed came from dogs imported from Scotland. These dogs were black and tan, longhaired with semi-pricked ears, medium-sized and of Collie type. Others were smooth-haired with erect ears, but still of Collie type. Litters from these dogs also produced red (liverbrown) puppies. The Australian Kelpie has been recorded in the Foundation Stock Service since July 10, 2017. 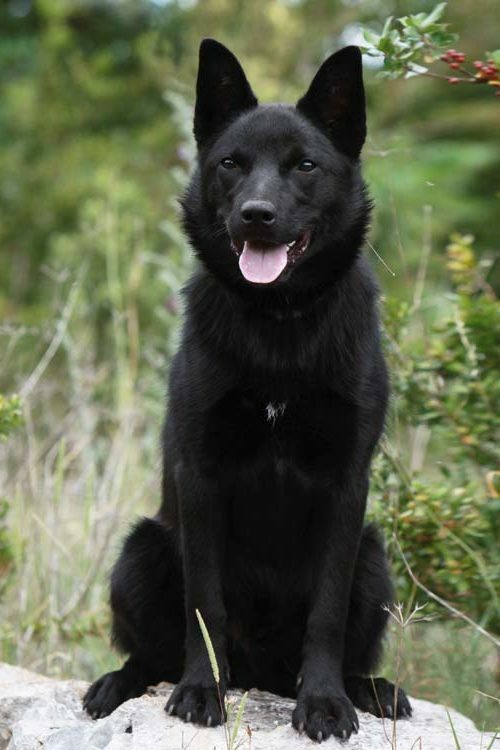 An all-black Australian Kelpie is also known as a Barb. The word "kelpie" is Gaelic, meaning water sprite. The Australian Kelpie has been assigned the Herding Group designation. On August 5, 2017, an Australian Kelpie name Abbie Girl won the World Dog Surfing Championship in Pacifica, California for the second year in a row. 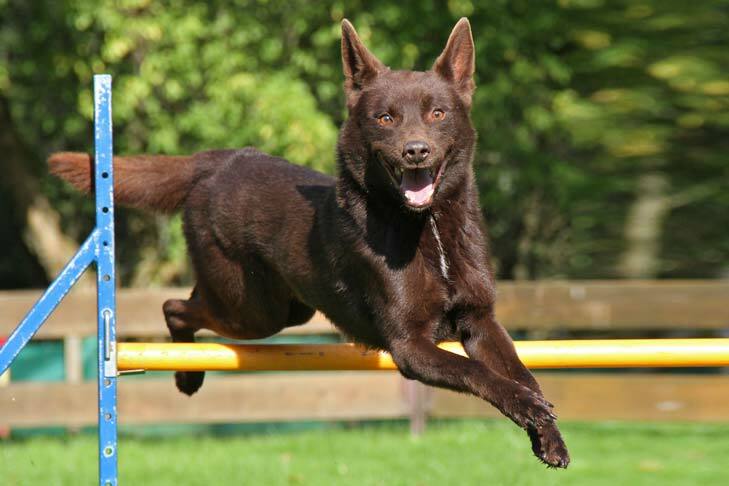 The breed is also known by its shortened name: Kelpie. Australian Kelpies make excellent watchdogs and can be trained as seeing-eye dogs. The head is in proportion to the size of the dog. The overall shape and contours produce a rather fox like expression, which is softened by the almond-shaped eyes. Tail: The tail during rest should hang in a very slight curve. During movement of excitement it may be raised, but under no circumstances should the tail be carried past a vertical line drawn through the root. It should be furnished with a good brush. Upperarm: Should be at a right angle with the shoulder-blade. Elbow: Neither in nor out. General appearance: Should show breadth and strength. When viewed from behind, the hind legs, from the hocks to the feet, are straight and placed parallel, neither close nor too wide apart. Stifle (Knee): Well turned. Color: Black, black and tan, red, red and tan, fawn, chocolate, and smoke blue.